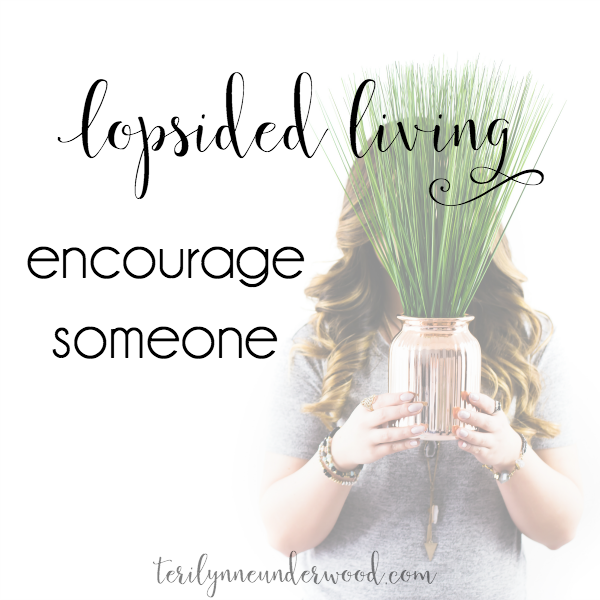 Welcome to Day 25 of 31 Ways to Embrace Lopsided Living! Today’s post is all about something I always MEAN to do … but often fail to accomplish. It’s one of those things that makes its way to my “to do” list every week and then gets bumped to the next week’s list. I know it’s important. I know it matters. And I love it when people do it for me. But somehow, in the middle of writing, laundry, and assuring the dog he doesn’t have to bark at every little sound, this is often what remains undone. Maybe you will be able to relate? Can I tell you why I usually fail in this area? It goes back to perfectionism and the need to do everything instead of something. I create these grandiose ideas about how I can reach out and encourage to others. So I plan to handcraft a beautiful card or bake a cake or send a gift card and then life happens and my plans fall through. Why? Mostly because I forget how adding anything affects everything. So I’ve been thinking about some realistic ways I can encourage someone without stretching myself too thin. Maybe one or two of these will resonate with you as well. Send a text. I know, this always seems like the easy way out for me. But truly, it’s better than not doing anything. Next time you think of someone, just send a quick text thats says I’m thinking of you or thankful for you. Smile. Really. I’m amazed at how a smile can impact others. We live in a frantic and busy world … a smile for the cashier at WalMart or Publix can be a huge encouragement. Make eye contact. Again, such a rarity in our world. Set down your phone and look someone in the eye. Ask how you can pray for someone. I’ve learned there are lots of people who won’t ask for prayers but will share a need if asked. Be an asker. Pray for anyone God lays on your heart or mind. You don’t even have to tell them you did. But God will work in it every time. Say thank you. In our increasing entitled culture, it is always encouraging when someone expresses gratitude. Give the benefit of the doubt. This one = huge! When someone is acting in a manner that isn’t their norm, give them grace. Set aside a specific time each month to do something for someone else. Of course we may not have time every day to write notes or bake cookies or go out for coffee, but if we plan one or two of those things into our calendars, we will be able to do them. Listen. Even if you don’t have a lot of time, giving others our full attention is such an encouragement. Be inconvenienced sometimes. If I’m really honest, there are days when I do have time to reach out and encourage and I don’t because it isn’t convenient. But sometimes we need to be willing to be inconvenienced and toss our plans to the side in order to encourage others. MAKE IT A POINT TO ENCOURAGE SOMEONE TODAY! In fact, just to help us all be accountable, share a quick comment about what you will do today to reach out to someone else. I’ll start: I’m going to a coffee shop to (hopefully) finish the Praying for Girls manuscript today. So, I’ll smile and give the barista my full attention and ask her how her day is going rather than just placing my order. What about you? 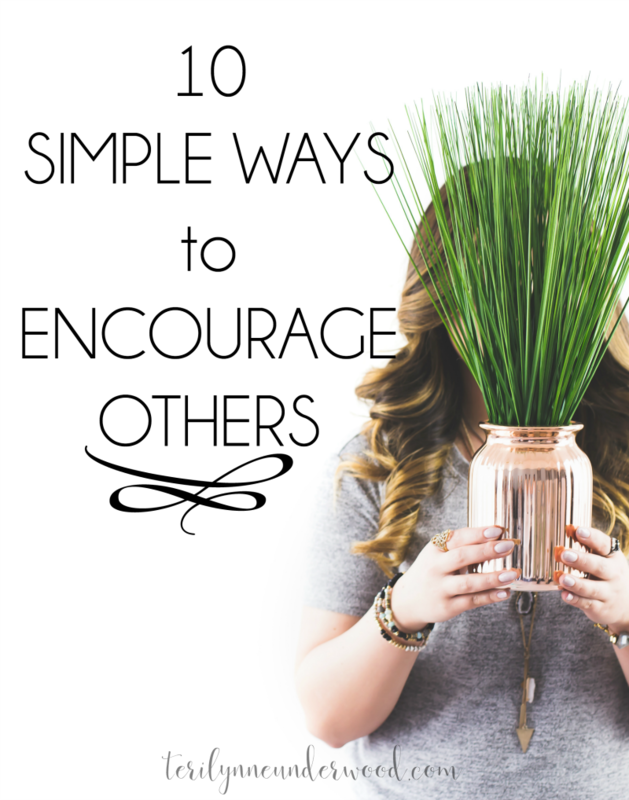 What is a simple way you can encourage someone today? Yesterday’s post: People are the priority! What a timely post. I had a sweet friend ask me today how she could pray for me and it made me stop and think- and I’m so thankful for her care. And in the middle of reading this post, I stopped to text a friend. Thank you for these gentle reminders.